As fall is descending down in the Northern Hemisphere, Mother Nature presents us with one of the most beautiful moons of the year. True, there is only one Moon and here on Earth, we have the privilege of sharing it. In the U.S., we call it this phenomenon, the Harvest Moon. 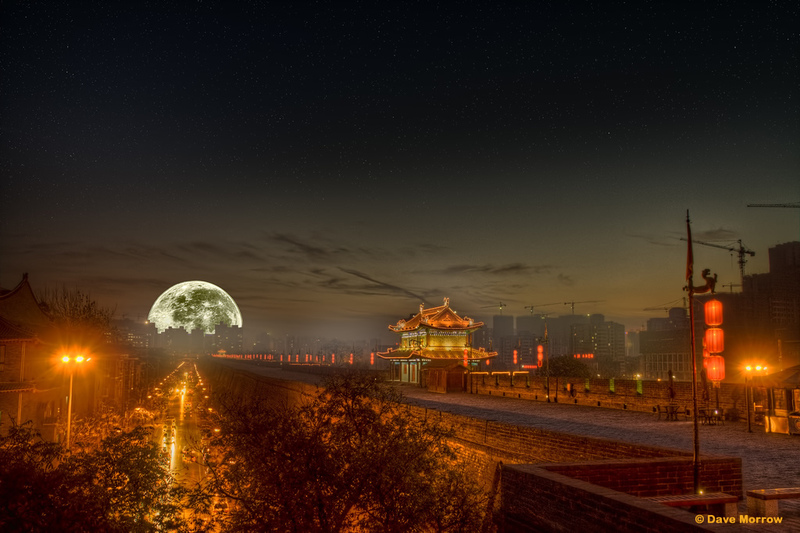 In China and many of the Asian countries, it is called the Mid-Autumn Moon. In China, it is said that many, many years ago, the country was going through a devastating drought, being scorched by ten suns. One day, an emissary of the King of Heaven, Hou Yi, was sent down to Earth to help. Immediately, with his bow and arrow, he shot nine of the suns out of orbit. Quite rapidly, Earth turned back to its natural self, and humanity survived. But, as a result of the confrontation, he was overcome by thirst. Luckily, a beautiful young woman, Chang’er, happened to be walking by with a bamboo container filled with water. It took only gazing into each others’ eyes one time for them to realize that they had fallen in love. Soon thereafter, they were married. However, there was a problem. Chang’er was a mortal and their happiness would only last as long as her life did. Hou Yi sought the help of the Western Queen Mother, who, understanding their predicament, concocted an elixir made from the fruit of the tree of immortality. If they both drank it together, at the same time, they both would live forever and so would their love for each other. 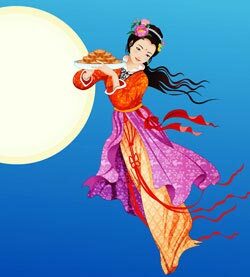 The lovers agreed to drink the elixir on the 15th day of the 8th lunar month, when the Moon is the brightest I the fall sky. However, if only one of them drank it, he or she would ascend to Heaven and become immortal. The other would not. As the story goes, a villain overheard their plan, and decided to drink the elixir himself. He proceeded to kill Hou Yi and demanded the elixir from Chang’er. Instead, she drank the elixir. As she was sobbing over her dead husband, a force pulled her o nto Heaven. She settled on the Moon, which was the closest to Earth. From there, it is said that she sends moonlit rays to shine over lovers and to illuminate love proposals. She also orchestrates the reunion of separated lovers under the Moon. Presently, families in China gather to celebrate the Mid-Autumn Festival and love. Mooncakes and lanterns have become a symbol of this celebration. Mooncakes are crusty pastries filled with red bean or lotus seed paste, and are exchanged between family members and friends. 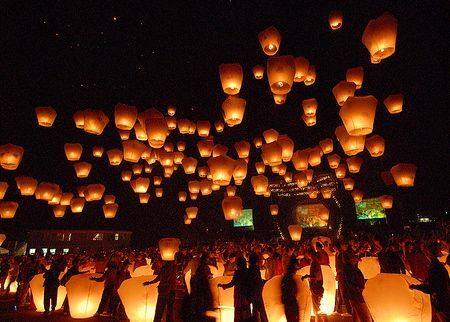 Lanterns are carried by children, or let loose to fly free towards the Moon. This year, the 15th day of the 8th lunar month falls on September 27. Join us at Yu’s New Beijing in Glen Ellyn to celebrate this fantastic holiday! This entry was posted in Chinese Festivals and Holidays and tagged 2015, Beijing, cakes, Chang'er, Chinese, Chinese anectodes, Glen Ellyn, Harvest Moon, lanterns, legends, Mid-Autumn Festival, Mid-Autumn Moon Festival, moon, moon cakes, Mooncake Festival, New Beijing, September 19, You Yi, Yu's Garden, Yu's New Beijing. Bookmark the permalink.